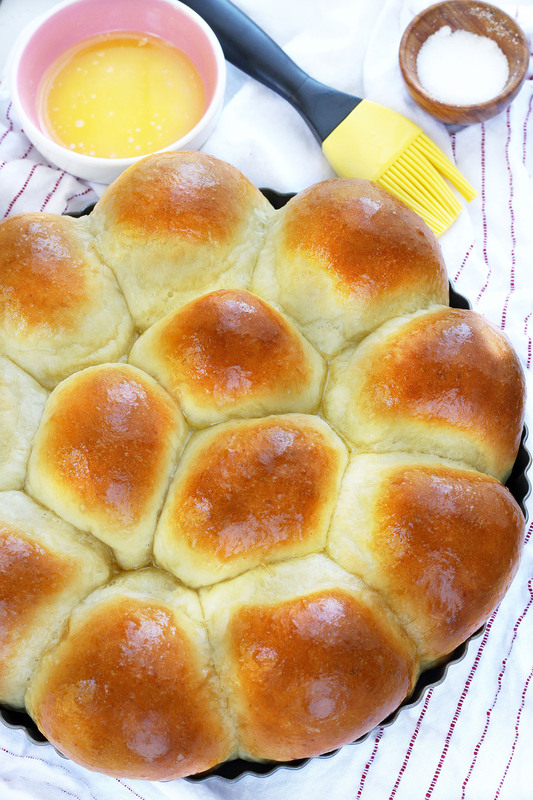 Soft and fluffy homemade rolls in less than 30 minutes! These foolproof dinner rolls are so easy to make you'll never go store-bought again! In a mixing bowl add the flour and make a well in the middle. In a measuring cup, add the milk, butter, sugar and salt. Microwave in 15 seconds increments until the butter is melted and the mixture is temperature is between 110 and 115°F. Pour half of the milk mixture into the flour well. Scatter the yeast over it. Gently stir and let sit for a few minutes. Fit the mixer with the dough hook attachment. Start mixing on low speed, slowly pouring the remaining milk mixture until the dough comes together, about 3-5 minutes. The dough should be soft and elastic and cleans itself from the sides of the bowl. Remove the dough from the mixing bowl and divide it into 12 pieces (approximately 73 grams each). Shape each piece into a ball. Place all the rolls into a greased 11-inch round baking pan or 13X9-inch baking pan. Cover the rolls with a clean tea towel and let rest for about 10 minutes. Preheat oven to 400°F. Bake the rolls for 17-19 minutes or until golden brown. As soon as you remove the rolls from the oven, brush them with melted butter. Recipe created by A Treats Affair. * You can substitute Red Star Quick Rise or Red Star Active Dry Yeast. Increase rise time (after shaping rolls) to 30-45 minutes. The short rise times in this will result in a denser roll than typical yeast-raised rolls. I used Saf Instant Yeast and all purpose flour with good results. The dough was a little dry so I added 2 tablespoons of warm water. I did increase the rise time to 35 mins. Have not seen “Platinum” yeast here in AZ. I followed suggestion for dividing cake yeast & adapted the recipe to my food processor. I’m a welll seasoned baker, but slowing down for an octogenarian. So, I appreciate something good but speedy. Am allowing a longer rise before baking. More later, but the feel is good and am confident in good final results. PS used fresh dill in the mix, YUM. These rolls were delicious and a huge time saver! Followed the recipe except for the bread flour. I used all purpose and they were still exceptional. Mine cooked for 20 minutes in a 9×13 glass pan. Thanks for the recipe! It’s a keeper! I would recommend using bread flour in this recipe, especially with the short rise times. Bread flour is a stronger flour that is needed to create the structure that holds the gas produced by the yeast during rising. Self-rising flour is not recommended for yeasted doughs. Use bread flour in this recipe. Bread flour is a stronger wheat flour that is needed to create the structure that holds the gas produced by the yeast during rising. More info on flour types can be found here: https://redstaryeast.com/yeast-baking-lessons/common-baking-ingredients/flour/. This looks like it’s going to be a family favorite. They’ve never met a dinner roll they didn’t like and the quicker the better. I might try knocking back the dough before it completes a full rise. I can’t find RED STAR Platinum Yeast! I’ve gone to 4 stores looking for it! I did buy Quick-rise and Active Dry. Can I use one of them? Yes, you can! See the notes section of the recipe for information. These were good rolls, fast and easy; the full dozen disappeared at dinner. When I first took them out of the oven, I thought the tops were hard but then I remembered the instructions to brush them with butter and they softened up nicely. I do recommend cutting the baking time down to maybe 12 – 14 minutes; I set mine to 16 min and took them out earlier than that–the listed 17 – 20 min will give you burned rolls. They look perfect when baked, but they are so heavy and gross when you try to eat them! Truly a waste of good ingredients. Did you use Platinum yeast? Unfortunately when you make a ‘faster’ bread, some qualities are sacrificed. This recipe is meant more of a ‘last-minute’ dinner roll. The denser texture you experience is due to the short rise times. You can always add in a first rise (https://redstaryeast.com/yeast-baking-lessons/baking-steps-guide/rising-ripe-test-first-rise/) and second rise (https://redstaryeast.com/yeast-baking-lessons/baking-steps-guide/proofing-ripe-test-second-rise/) before baking. This will yield a more light & airy roll. If you try this, also decrease the yeast to 1 package (2 1/4 tsp).